The 2nd book in the BLUE-COLLAR BILLIONAIRES series by New York Times Bestselling Author M. Malone. 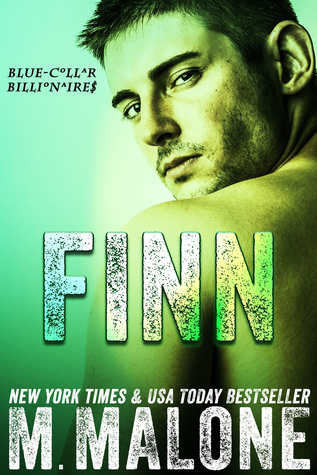 Finn Marshall survived several tours in Afghanistan before the billionaire father he barely remembers changed everything. Now he has it all: money, cars and most importantly, power. Power to track down the woman who left him for a richer man. Marissa Blake dragged herself out of poverty one client at a time, so she's thrilled when her company, Maid-4-U, gets a huge contract for a luxury penthouse. Until she sees who owns it. Finn Marshall is overcoming his injury to his leg from his last tour in Afghanistan and is also dealing with his father who left his mother, brother, and himself when he was younger. They went from living in a nice home and having things to being in a trailer park and watching his mother struggle every day. While his father paid her nothing and started over with a younger women and become wealthier if that was even more possible. When he returns from his injuries to his hometown his father gives him money along with his brother and this helps because their mother has cancer and they are able to pay for better care and new treatment. His one big hurt is the girl that he feel in love with at the trailer park Marissa Blake, and they started dating throughout high school and his first two tours. Getting ready to leave for his third tour and not always being able to talk to him because he was an Army Ranger she gives him the ring back and walks away with a guy they knew in school Mark, who comes from a wealthy family. They get married and get divorced or it appears that way from the way the story is written. Finn is now rich and now Marissa, along with two of her friends own their own business Maid 4-U. They get a new contract for a luxury apartment that will help them in many ways. The biggest one financial. She does not know it is him until after she shows up and then has to be their every day. His plan to get back at her fails and he realizes of course that he is still in love with. He still has to deal with his pain from his leg and their break up, and also forgiveness. She also has things she needs to overcome as well. That is what the bigger part of the book is about and overall it is a good story. I wish a very parts could have been condensed it still would have made the story good, but would have passed over some of the slow parts. Overall a good book. I got this book from netgalley. I give this 3 stars.